Encantada Resort is a family-friendly gated community just off HWY192, just a few minutes from Disney's doorstep in Kissimmee, Florida and is perfectly placed for the shops, restaurants, fun and attractions that Orlando has to offer. 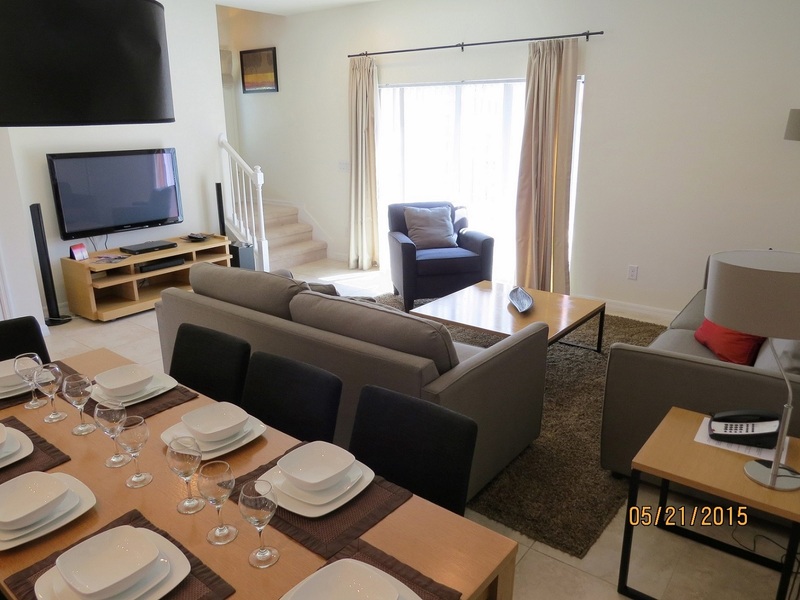 With 3 bedrooms and 2.5 bathrooms, this fully air-conditioned, family friendly vacation home is perfect for families or for a few friends golfing or vacationing. 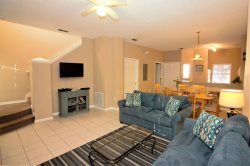 This Vacation Home has a spacious family room to relax in during the day or evening, with a luxurious queen size sleeper sofa, flat screen HDTV, DVD and WiFi. The main living and dining area are completely tiled. There is a full sie washer and dryer located on the main floor. Step from the family room into the spacious Dining room and visit with family while enjoying a great meal prepared in your own fully equipped kitchen. The huge table with six chairs is a great place to eat and relax with friends and family. The kitchen has been equipped with everything that you could need to provide a family feast to enjoy together. Luxurious sleeping accommodation awaits you when you stay at Encantada Vacation home with 3 bright and roomy bedrooms. The master bedroom has a king sized bed and a tv. It opens onto an attached ensuite bath with a big shower. The second upstairs bedroom has a queen bed. The other upstairs bedroom has two twin beds and it shares the hall bath with the queen room. Off the living room, is a huge, screened lanai with lots of seating and lounge chairs, as well as your own private spa! Make use of the huge, zero entry community pool and 2 spas, in addition to your own private hot tub. Let the kids frolic the awesome playground. The 9000 sq. ft. clubhouse has a well equipped fitness room, just in case you can squeeze some exercise into your vacation time! Take a walk on the paved pathways to enjoy the grounds, beautifully lush with trees and gardens, as well as a lovely lake and gazebo area.